Chronic dry eyes is a common eye problem. Actually, to relieve dry eye, eye drops may be first prescribed or bought over the counter and applied repeatedly. 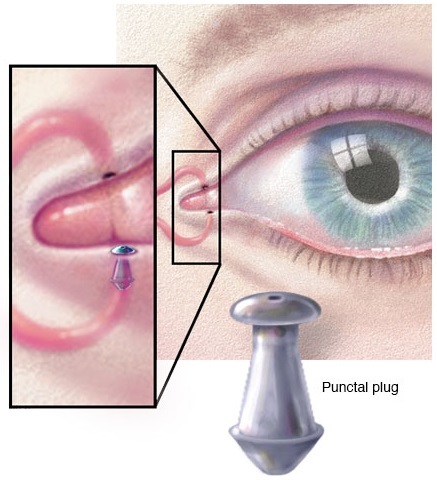 If eye drops do not work, eye doctors suggest inserting punctal plugs into the tear duct openings (puncta). These tiny devices increase the surface moisture of the eyes by blocking the drainage of natural tears. This is what those searching for "eye plugs" on google want to find. Semi-permanent plugs are made of long-lasting materials like silicone. Dissolvable plugs are made of collagen or materials that the body can eventually absorb. These punctal plugs usually last for a few days to several months and they may be used to test if they improve your condition, after which semi-permanent plugs may be used. Temporary punctal plugs may also be placed to prevent dry eyes after refractive surgery such as Lasik. Punctal plugs also come in different shapes and designs. They can be made of collagen, silicone, polydioxanone, hydrophobic acrylic polymer, or hydrogel. Some are coated to make their surface slick and easy to insert. In general, soft plugs conform readily to the shape of the tear ducts and are more comfortable. These are suitable especially for older people whose drainage channels are less elastic and enlarged. Each eyelid has a tear duct opening or punctum located near the nose. An eye doctor starts by examining the puncta to determine what type and size of punctal plug will be suitable for you. Some doctors may apply a local anesthetic before inserting the plugs but in most cases, this is not necessary. Those searching "eye plugs" on google should know that a punctal plug may be inserted in the upper lids, lower lids, or both. An instrument is used to dilate the puncta to facilitate insertion of the plugs. A disposable device is used to insert the punctal plug, and this device comes in different designs (ex. forceps or syringe style). Punctal plugs may be placed so that they can be removed anytime or they may be placed in deeper. Deeply placed intracanalicular plugs may be removed by flushing them out. Once they are inserted, you will not be able to feel them and you can resume your normal activities. Insertion of punctal plugs is usually uneventful and non-problematic. However, some people develop excessive tearing, which causes watery eyes. In this case, the punctal plug may be removed or replaced with a different type to control tearing. Displacement or inadvertent removal of the punctal plug is quite common, especially in those who rub their eyes. Rigid or semi-permanent punctal plugs are more likely to be dislodged and lost. Your doctor will have to replace the lost punctal plug. Eye infection associated with punctal plug insertion (canaliculitis) is rare but they do occur. Symptoms include swelling of the eyelid and production of yellowish secretion. This may be caused by upper respiratory tract infections that are transmitted to the tear ducts when one forcibly blows his nose, forcing microorganisms to move into them. Treatment includes using topical and oral antibiotics as well as removal of the plugs. Other less common complications include migration of the punctal plug outside the tear ducts, leading to blockage of other parts and accompanied by swelling, discomfort, and pain. Tissue reactions can also occur with rigid punctal plugs. If these reactions result in extra tissue formation that leads to slowing of tear drainage, then these may be beneficial. If you want results for searching "eye plugs", then how to remove punctal plugs should never be missed. Rigid, semi-permanent punctal plugs are easily removed, although they can also last indefinitely. If you feel any discomfort or eye infection, notify your doctor for possible removal or replacement. These may be easily removed with the use of forceps. Otherwise, they can also be flushed out with saline solution into your throat or nose, where tears normally drain.